Adorable knotty pine cabin at Bass Lake. 2 bedrooms downstairs each with a queen bed. A large loft upstairs with 6 beds and a half bathroom great for kids. A cozy kitchen and living room area with a full size washer and dryer. A large outdoor deck with plenty of seating to enjoy the amazing views of the lake. Walking distance to the Pine's Village with access to restaurants, shopping and grocery store. Beach access is just steps away. Also includes a boat slip. Perfect for a week at the lake or a stopping point on your way to Yosemite. Large porch with views of Bass Lake! All beds are made for guests upon arrival. We truly enjoyed our stay at the knotty cabin! We had a pleasent stay. We would like to stay there again! I am so glad you enjoyed your stay. And yes, please come again!! We'd love to have you! Feel cozy and warm inside with nice wood finish color throughout the cabin. We love the deck with lake view for morning coffee. Recommend to visit Lewis Trailhead for family with kids. Thank you for the great review. Please come again!! Our Family Holiday Bass Lake Getaway was that much more enjoyable as we stayed in the Knotty Cabin. We enjoyed lake views from the deck, fishing on the beach, cozy fires and classic movies, and shared memories as a family. Plenty of beds! Great to have the upper half bath for the youngest members too ! We will truly come back in the future. We are so glad you enjoyed your stay!! Thank you for choosing the Knotty Cabin. And yes, please come again! Beautiful place, excellent location...exactly what we were hoping for! We loved staying in this cabin! The amenities were perfect. The location was beautiful, complete with views and small beach to play on. 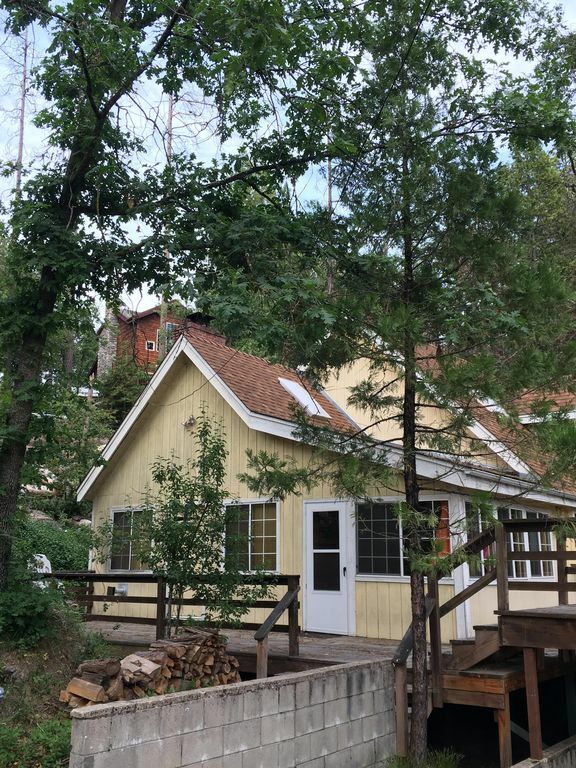 Great Location, Cabin, and Host! Not only was the cabin perfectly located close to the water, the Pines ( store, bar, etc) it was adorable and worked perfectly for our girl trip! Patty was so responsive, sweet, and accommodating which made the stay THAT much better. We will definitely be coming back, and will be renting the Knotty Kabin! Thank you Patty for answering all my questions and being so kind! Very nice accommodations overall. Enjoyed the view and deck. Proximity to village was a plus. Yosemite South Gate is 20 miles away!